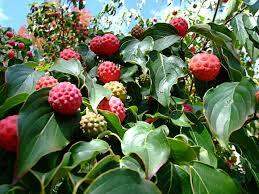 Kousa Dogwood Tree For Sale - Lowest Prices Online Today. I was uncertain about ordering a tree online, but I am SO glad I did! It was delivered right to my door, and it is doing splendidly!! Native to Japan and Korea, the Kousa Dogwood Tree thrives in bright sunshine or partial shade. This small tree (or large shrub) puts out dark green oval leaves that change to scarlet in the fall. The Kousa dazzles because it's large 3 to 5-inch flowers. Four narrow, white petals surround a yellow-green center that invites butterflies to sit. By the middle of summer, the center flower becomes an edible reddish berry that birds will enjoy. With a gray and tanbark, this disease and cold weather resistant tree adds variety to property lines, shrub borders and landscaped gardens. The Kousa Dogwood Tree is among the unique and attractive trees around. One of its unique characteristics is its leaves. The leaves are green but also grow white flowers along with them. Therefore this can be a beautiful tree to have in your yard. The branches expand to a length of up to 20 feet. However, most of the branches extend to 15 feet. The trunk of this tree is skinny and among the narrowest compared to other trees. Regarding landscaping, this tree can be planted in either your backyard or front yard, as long as there is enough space. 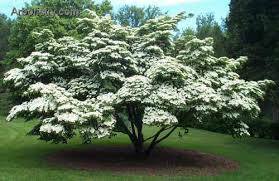 This Kousa Dogwood Tree has Beauty! It will give beautiful blooms during the spring and summer months. These trees love well-drained soil conditions. Kousa Dogwoods will also do well in drought conditions. By having this tree in your yard, you will have a lovely tree that will help make your yard stand out. The full blooms and beautiful flowers stand out and will catch the attention of any passerby or neighbor. They are small to medium growing compared to Oaks and Maple trees, but the color makes up for the size. Many homeowners like the size and prefer to have one with more color than volume which consists of more trunk. The flowers shine when the sun glistens upon them.